Next week, I'll be covering Ed Brubaker’s beginning run on Captain America, and while I still think it’s a very, very good comic, I also can’t help wondering if my memory of it was greater than it was in actuality. While I was reading it, I had never been an ongoing Captain America reader before, and I want to say I appreciated how much Brubaker was able to make me care about characters I never cared about before on a monthly basis. In a sense, I was surprised by how much I was enjoying it. That’s not a feeling that can ever be replicated again. 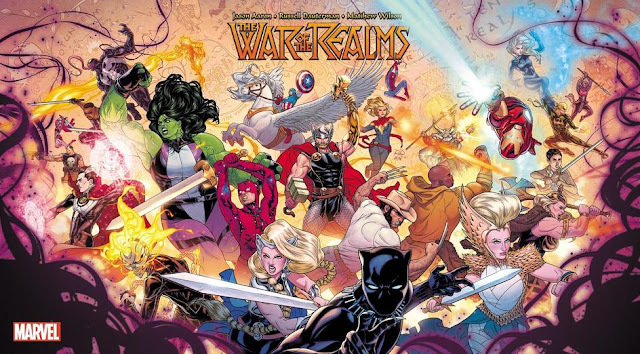 If I had never taken the time to reread the books, it’s possible my memory of the reading experience was going to continue to outweigh what the comics actually are (again, not to say that they’re bad, just that they had been built up to an unreasonably high level in my mind). Or maybe I just need to stop reading comics in bed before I go to sleep. This brings me to my next theory, and that is that I think the idea of the story, the central premise, sometimes resonates longer with the reader than the execution of the story as a whole, especially in comics. If you’re anything like me, your reading retention level isn’t very long, so as the page to page happenings fade away, sometimes all you’re left with is the idea of the story, your reaction to the story, or what it means to you in a larger sense. Which is all a very long-winded way of prefacing that I don’t think I found Mark Gruenwald’s Captain America to be all that entertaining. I started with probably his most famous storyline, where he’s forced by the government to surrender the Captain America identity. I feel like this is truly a case where fans remember enjoying the idea of the story, more than the actual comics were any good. To follow, I’m going to show you some of the more ridiculous, or notable for some reason, moments from the beginning of this storyline. It begins with a mysterious shadowy council of government suits giving Steve Rogers an ultimatum, work for them or give up the suit and shield. I understand Gyrich being a real prick about this, but the remaining council members I just can’t imagine being this adamant about taking down the living embodiment of America. It seemed very forced to me, but that’s okay, because there’s no other way to tell this story otherwise. 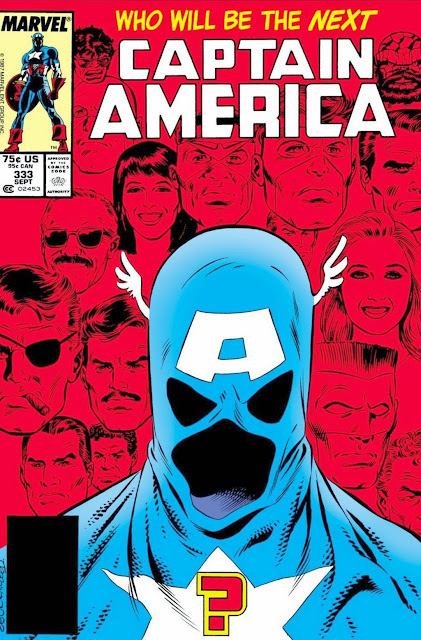 Following Steve Rogers giving up the identity of Captain America, issue #333’s cover asked the question of “who will be the next Captain America?” Of note in the background, besides Stan Lee, is Doctor Octopus, which convinces me this was the impetus for young Dan Slott’s storyline where Doctor Octopus switches minds with Peter Parker and becomes Spider-Man. An upstart young hero named John Walker that was introduced at the same time Rogers was being forced to resign, obviously is picked to take over the role of Captain America. A fighting comrade of his was picked to be the new Bucky, and they commenced with their training by the government. 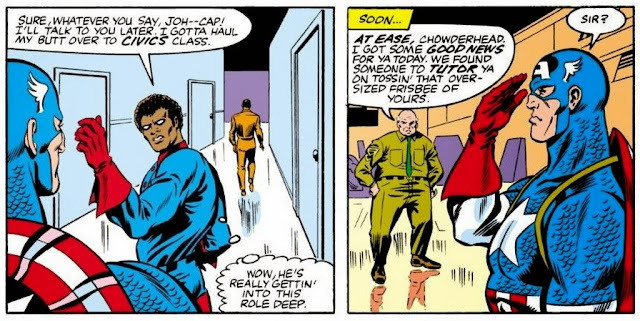 This scene of the new Bucky saying he has to leave for his remedial English class I found humorous. And later on, civics class. A religious zealot group called the Watchdogs is introduced, violently destroying anything or anyone they consider morally corrupt. 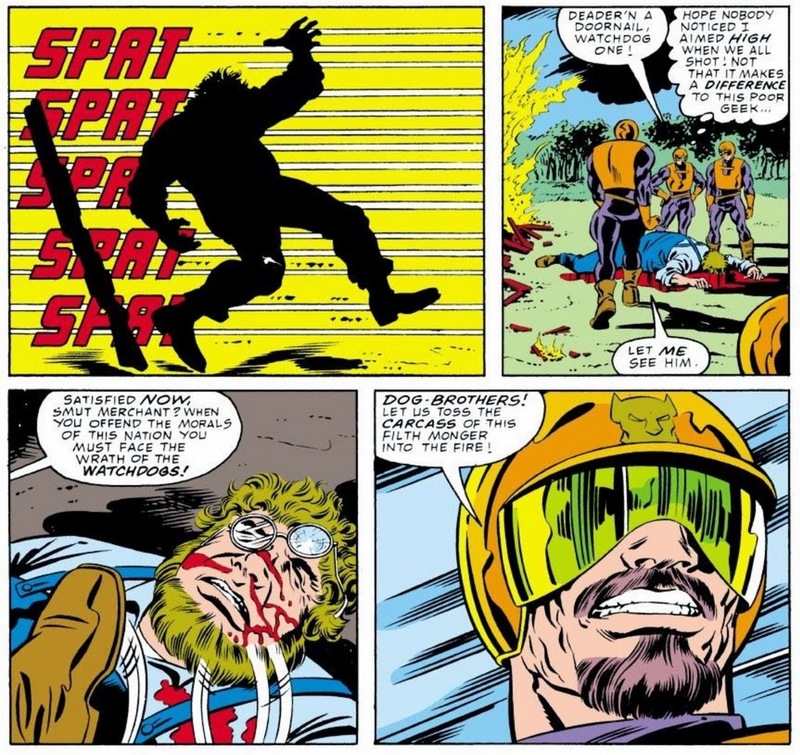 This grisly shooting scene is another case of a moment of shocking violence taking place in a time when that wasn’t as common in a book like Cap. This panel of John Walker silently agreeing with the things the Watchdogs are publicly against was an interesting choice. This next page, depicting two shirtless men sharing the same hotel room, stood out, if only because they were about to run a fake modeling talent search, in an effort to lure the Watchdogs (because modeling is a terrible thing apparently). We then get our first look at the retired Steve Rogers, after being absent for the previous issues, with his glorious yellow beard, and fresh off having quit his job with Marvel Comics. 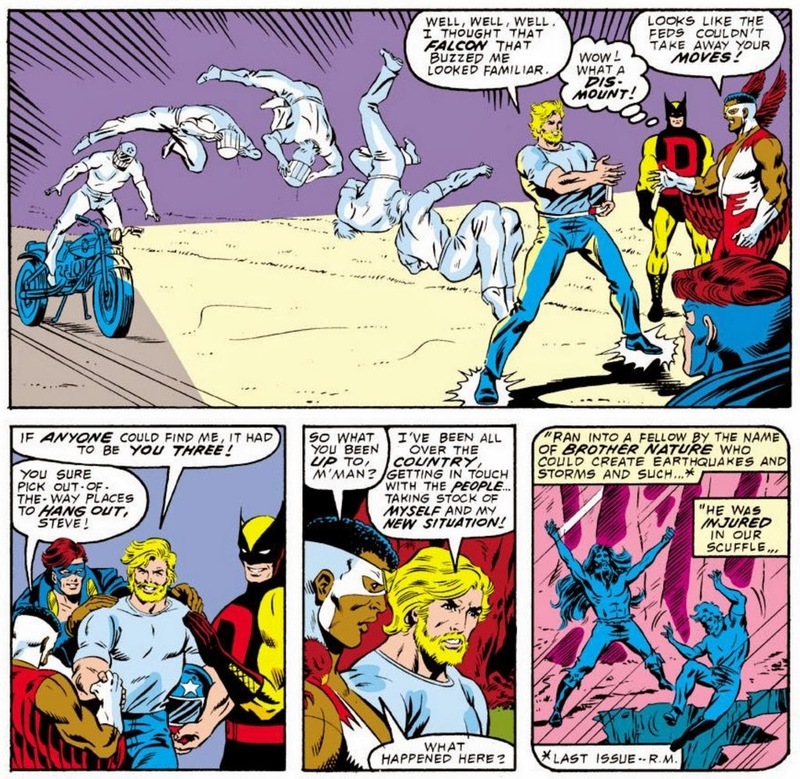 Gruenwald tried to establish an ensemble cast for Steve with Falcon, Nomad, and D-Man (he was significantly more terrible at this than Brubaker would eventually be). 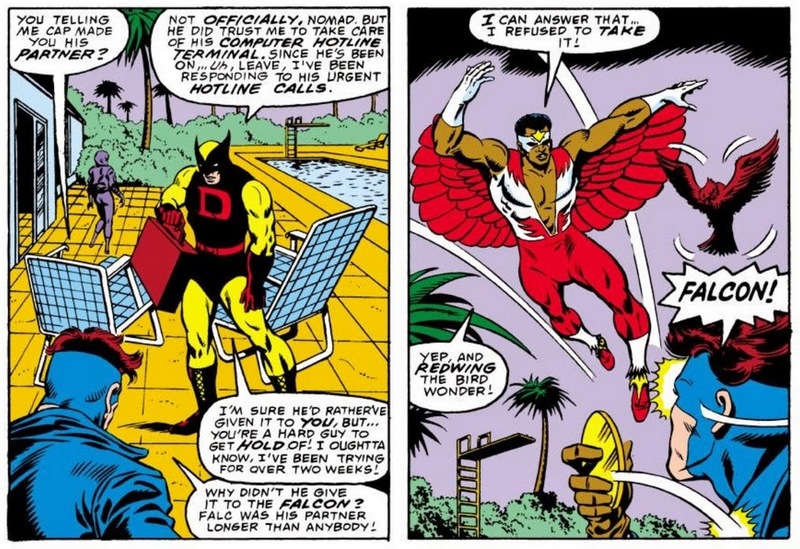 Nomad is particularly jealous about the relationship D-Man seems to have built with Steve. “Redwing, the bird wonder” is probably the dumbest thing I’ve ever read in a comic, and I’ve read Winnick comics. Steve’s first foray back into the world of action and adventure was against a bio-terrorist named Brother Nature, who had the power to create Earthquakes. Steve is chasing him down in the forest here, when he was to backhand an attacking owl (with the accompanying hilarious sound effect “hooot!”). This skirmish drives home the point to Steve, that he “must not declare war on appointed officials of my nation’s government!” Now, I’ve seen Captain America stories where he considers himself an agent of the government, or when he considers himself a representative of the American people. 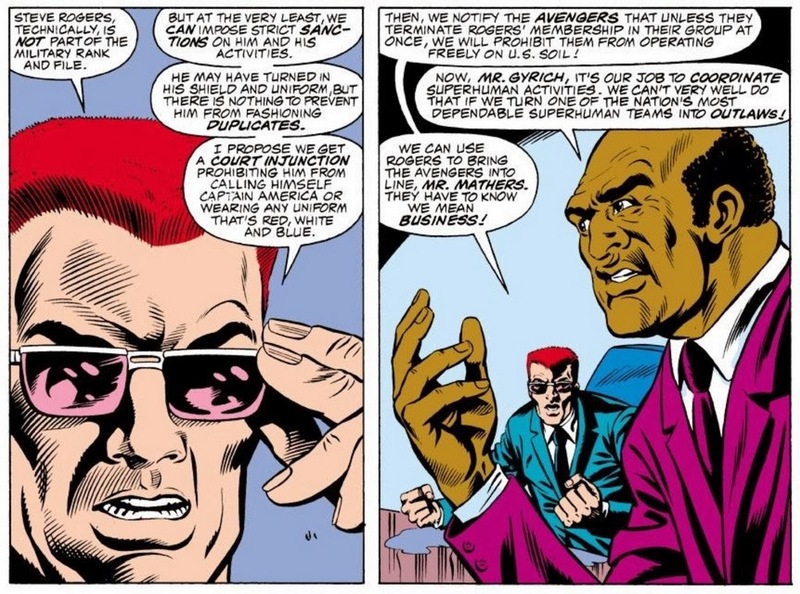 I’ve seen both sides explored in stories, but I have a hard time reconciling the level of blind obedience to authority and to the law that Gruenwald is depicting Steve Rogers to have here. Falcon, Nomad, and D-Man eventually track down Steve, which leads to this ridiculous and impressive motorcycle dismount. The Serpent Society is causing trouble, and wants to make sure the police spell their names right (one of the few, I assume, intentionally humorous parts of the run). 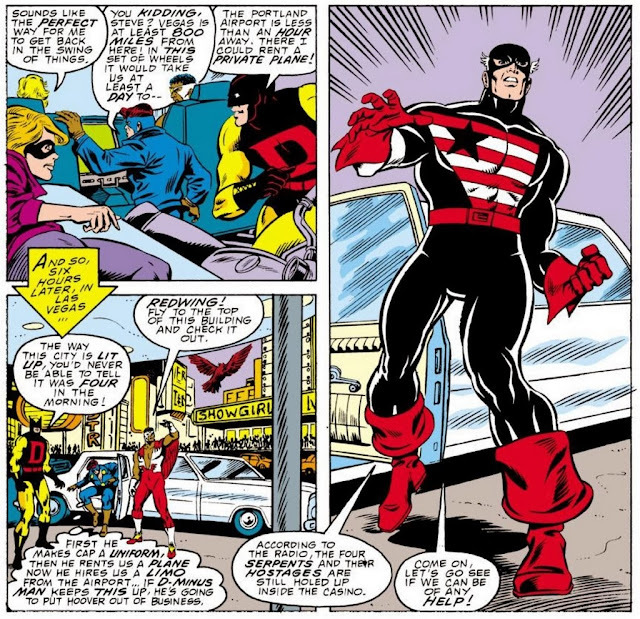 This last group of panels shows Steve agreeing to blindly adhere to whatever punishment they may receive over ignoring a police order not to get involved with the Serpent Society hostage situation. Once again, this is a level of blind obedience to the law that I don’t associate with Captain America in my mind. Furthermore, it introduces the concept of if Steve is willing to break this law, what’s to stop him from breaking more, and how will he know when he’s gone too far. (I’ve seen this as an argument for why Batman doesn’t kill the Joker also.) This is extremely ridiculous. The idea that he would be afraid that ignoring one police order, a decision that saved several lives, would somehow lead him to a life of crime and villainy is insulting. I’m fairly certain Steve Rogers isn’t a moron, and shouldn’t be portrayed as if he is going to lose his ability to ascertain the right and wrong thing to do in any given situation. Not that he’s always going to be correct in that choice, but the idea that he’s already lost his moral compass is a stupid one. I know Gruenwald was trying to create something here that had some resonance, some sophistication. Watchmen loomed large over everyone at the time. But he just wasn’t able to do it here. I think his Squadron Supreme maxi-series was able to do achieve those goals much more effectively, by introducing some forward-thinking concepts and approaches that I’m surprised don’t get a lot more attention than they do, considering the time period it came out. 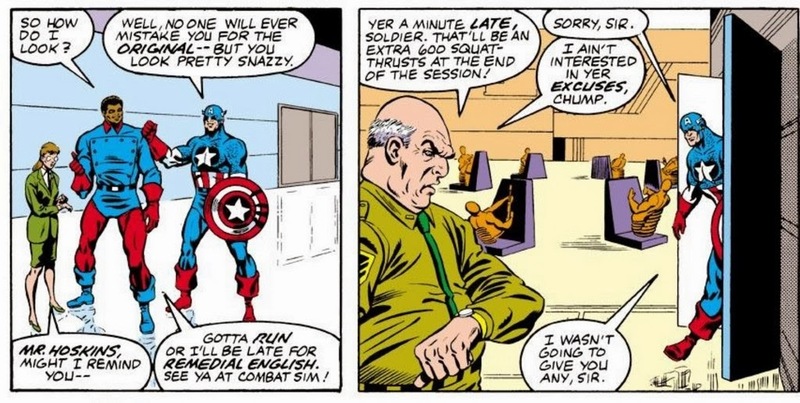 However, his Steve Rogers was just way too much of a boy scout here, and John Walker was cartoonishly conservative. I know the intent of this type of story is always to show how much worse the replacement is than the original, so you can remind readers of what makes the original so great. Instead, so far, they’ve shown a character in John Walker that is only slightly more conservative than Steve Rogers is. To the point where they both look like idiots. The writing is pedestrian, and the art is bland and generic. I hate to say these things about Gruenwald, because from all accounts he was a terrific person, and he created many other more enjoyable comics, but I just didn’t enjoy these on any sincere level. Which all circles around to my beginning point. 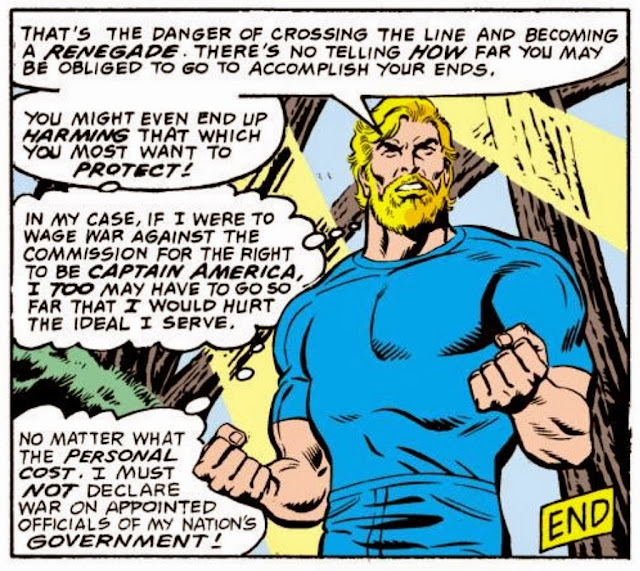 I think people remember this storyline much more for the idea of it, Steve Rogers being forced to quit as Captain America by the government, than they actually would enjoy reading these comics again. Comic books are a medium that is ever-evolving and, I believe, improving on a continuous basis. This isn’t universally true of course, but I do think this constant evolution can sometimes lead to a much beloved memory of a series or run, not living up to that memory the second time around. Sometimes they do. Sometimes something you didn’t enjoy the first time, you can love the second time with a different perspective in place. That’s one of the great things about reading comics. Reading is fundamental, kids. Teach a hobo to read. X-Statix still rocks though, that will never change. I love how Gruenwald's Cap had never taken a life in WWII as well. After regularly collecting Marvel Comics for about 14 years, I mostly quit circa 1986. Aside from just growing out of interest in standard superhero comics, I was tired of what I regarded as substandard writing & art, Captain America of that period being a prime example. Maybe I was spoiled by the far superior writing & art of Allen Moore's Swamp Thing, but Greunwald's characterizations in Captain America just weren't convincing to me. Maybe my 14 year old self could have gotten into it, but not my 24 year old self. I had given up collecting title based on the character or company and had taken up, albeit selectively, getting comics based on my appreciation of the particular artist and/or writer. Simonson could keep me getting Thor even after he had quit drawing it, but Greunwald couldn't keep me collecting Captain America. Squadron Supreme preceded Watchmen, so I don't think it is fare to insinuate that Gruenwald was attempting to channel Moore. One of the things that made Gruenwald's run on Captain America so memorable, to me at least, was his focus on flawed, fallible characters who were capable of losing fights and making poor decisions. Along those lines, another thing that made it great fun was that his fights--often between characters who weren't guaranteed winners, such as Hyde and Cobra--were so well "choreographed". I also found that Gruenwald's Captain America demonstrated WHY he was considered a moral paragon through his actions and I thought he did a good job revealing his inner life as well and how he came to his decisions, making him an interesting character while not compromising his do-gooder status. Dr. Faustus' discovery that Captain America was perhaps incapable of conceiving of his own defeat was one among what I consider many of Gruenwald's classic moments where he illustrated just what it was about Cap's character that made him so special.